Spitfire Premium Kentish Ale was first brewed 25 years ago to honour the 50th anniversary of the Battle of Britain. 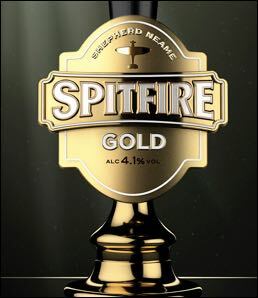 As 2015 marks 75 years since the historic air campaign, brewer Shepherd Neame decided to commemorate the occasion by launching Spitfire Gold, which will be a permanent addition to the range. JDO Brand & Design worked with Shepherd Neame on the branding of the new product, having previously worked on the core Spitfire brand (pictured above) as well as on redesigns of Whitstable Bay and Master Brew. Spitfire Gold (4.1%) is a light golden ale. It has a taste profile and branding to appeal to a wider audience and is on trend as a sweeter, less bitter beer. Its sweet malt base is built upon with delicate floral and pine aromas imparted by some of the most popular hops of the moment, including Centennial and Saaz. The brand launches in cask nationwide this month with further beer styles and additional packaging options to follow in the future. JDO’s approach was to celebrate the occasion and fresh, new taste profile of Spitfire Gold with a change to the iconic red, white and blue of the existing design whilst retaining the familiarity of the Spitfire identity for consumers. This was achieved by a muted gold palette that reflects the bright malt base flavours, contrasted with burnished metal edges to represent the soft, sweet finish. Polished and satin gold finishes throw the silhouette of the Spitfire plane into sharp relief and the traditional detail has been stripped back to deliver a simplified, cleaner and contemporary brand look and feel.